POMONA — A plaque marking the site of the Pomona Assembly Center was dedicated the Fairplex on Wednesday with several dignitaries on hand as well as Japanese Americans who were confined there 74 years ago. The Los Angeles County Fairgrounds was one of 15 temporary assembly centers established during World War II pursuant to Executive Order 9066, signed by President Franklin D. Roosevelt on Feb. 19, 1942. This represented the first phase of the mass incarceration of 97,785 Californians of Japanese ancestry during World War II. The Pomona Assembly Center held people from Los Angeles, San Francisco, and Santa Clara counties. In August 1942, the majority of the detainees were relocated to Heart Mountain in Wyoming, one of 10 detention camps that collectively confined 120,000 people without due process of law, charges, trial or establishment of guilt as a result of hysteria and racism. 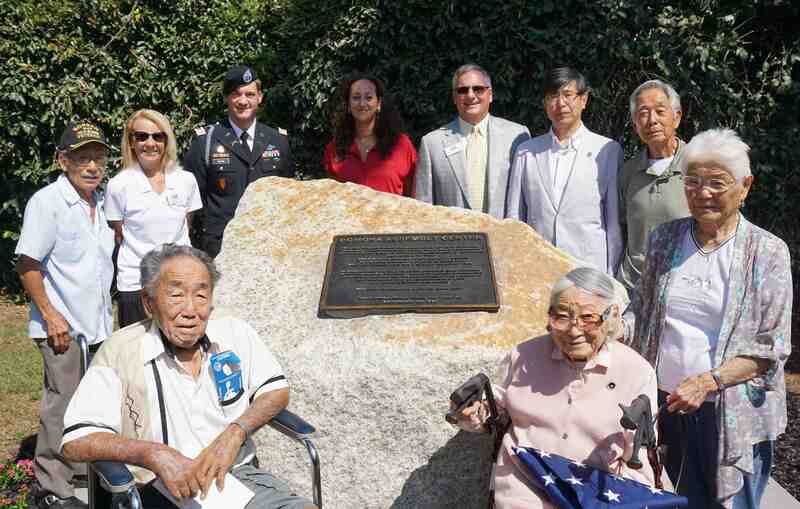 With the assistance of the Pomona Assembly Center Committee (chaired by Bacon Sakatani, who has been active in preserving the history of Heart Mountain), the Historical Society of Pomona Valley, the Fairplex, and others, the plaque has become a reality. Representatives of those groups, joined by newly arrived Consul General of Japan Akira Chiba, took part in the ceremony. With the dedication of California Registered Historical Landmark #934, participants expressed hope that the injustice and suffering experienced at Pomona will never occur again. Great to see the photo of Bacon Sakatani and others who work to preserve the memories and lessons from the war time incarceration of people of Japanese descent. Our family is from the Yakima valley town of Wapato,Washington. We got sent to Heart Mountain where we joined internees from San Jose ,California and Los Angeles area people confined first at Pomona.